Come explore your life script by using your natal (AKA birth) chart to learn astrology! Anne describes her Beginning Astrology: Understanding Yourself and Others course as analogous to building the foundation of a house. If the foundation of your house is secure (i.e., your basic understanding of astrology), then your house (i.e., your future studies of astrology) will stand strong for years to come. By combining her knowledge of astrology, her background in psychology, and her love of teaching, Anne will guide you through a step-by-step process of interpreting your own natal chart. Through this process you will not only build the foundation of your house, but will also gain amazing insights about yourself and information that will lead to greater self-acceptance and peace of mind. Where in your life will luck and recognition most likely come from? How do you prefer to communicate with others (and be communicated with)? What qualities do you need in a work environment or in a significant other in order to be happy? How do people view you (even if you aren’t aware of it or comfortable with it)? What do you need to heal within yourself before you can help others? RETAKE THE COURSE FOR A REDUCED FEE: A limited number of seats in this course will be made available for those who have previously taken Anne’s multi-part Beginning Astrology: Understanding Yourself & Others course. Contact Anne in order to determine if you are eligible for the reduced fee and to discuss payment options. DATES: 4th Thursday of the month. The next start date is currently being selected. Please be sure to join Anne’s Online Community so you will receive announcements regarding scheduled dates. In the meantime, please let us know if you’d like to be added to the “Interested List” for this course. Although not mandatory, in-person attendance at the first class is STRONGLY RECOMMENDED. Assuming space is available, this class MAY remain open to new members until the second class. After that time, no new students will be added to the class. 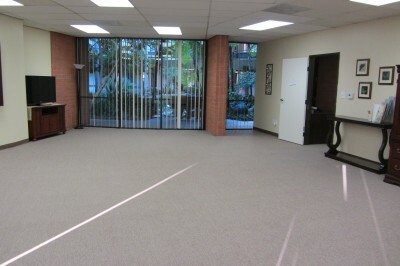 Classroom where Astrology Classes are held. It has beautiful floor-to-ceiling atrium views. TUITION: Course includes ten (10) 2-hour classes, in-person instruction, access to video archive of class meetings, manual, and all astrological charts. For any additional payments, the student must either (a) provide a post-dated check(s) or (b) provide credit card authorization. 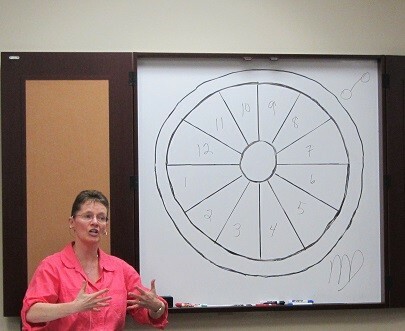 Having your natal (birth) chart is an important part of your enjoyment of this course. If you do not have exact birth information, you can still enroll in this course. However, please consult with Anne before preregistering. Anne would be glad to prepare additional charts for your family or friends. There will a $15 charge per chart. Anne also teaches the following Astrology courses: (a) Intermediate Astrology: Aspects, Configurations, Patterns, and Basic Chart Interpretation and (b) Advanced Astrology: Advanced Natal Chart Interpretation, Transits, and Much More!